You ARE Poly. We're stronger because of you. We're inspired by who you are, what you do, and what you care about. Discover all the ways you can become more involved with Poly — from attending events shaped just for you to volunteering for Reunions or joining a board or affinity group — we'd love to see more of you! There are many ways to get involved, depending on how much time you have and where you live. We have listed a few opportunities below. For more information or questions, please contact the Alumni Office. Also, if you have other ideas for how you would like to offer your time and talents, please feel free to share your ideas with us for consideration. Poly alumni affinity groups provide opportunities for alumni of shared interests and common bonds to connect in meaningful ways beyond the traditional regional event structure. The groups promote continued engagement with Poly and an active relationship with the alumni community by promoting career development, learning opportunities, and volunteerism. Groups may be formed to represent an industry, professional interest, or a shared identity. View and join existing groups on the PolyConnect platform. Contact Katherine Vieser, director of alumni and community relations, to learn more about the affinity group program and how to start a group based on your career or affinity interests. For alumni who are passionate about Poly and desire to more deeply invest in shaping, building, and promoting our Alumni programs, the Alumni Board is an ideal leadership role. While serving on the Alumni Board requires a regular commitment of time, it provides a great opportunity to gain a big-picture understanding of our school's mission and core institutional priorities, be among the first to know about strategic decisions made by the Board of Trustees, and directly influence and positively impact our alumni programming. To learn more about the Alumni Board or to express your interest, please contact Alumni Association President Lori MacPherson '85 or any member of the Alumni Board. Several times throughout the year, the Alumni Association holds social events for alumni, parents, and friends locally, across the country, and internationally. We are happy to work with you to plan an event for Poly alumni in your area! Events can be an informal social gatherings in your home, office, or other institution offering alumni a chance to meet-up and make new connections. Please contact Katherine Vieser, director of alumni and community relations, to learn more. The Poly Fund is Poly’s top giving priority, and alumni volunteers are essential to the success of each year's fundraising campaign. Through peer-to-peer outreach, volunteers reinforce the efforts of the Advancement Office to communicate the value of investing in the School, educate alumni about the importance in participating in the Poly Fund, and securing crucial financial support to continue to enhance the Poly experience. For more information, contact Elizabeth Shdo, director of the Poly Fund. PolyConnect Online - Join the network! PolyConnect is Polytechnic School’s private, online professional community of alumni. The platform is currently open to all alumni and Poly junior and seniors who apply to participate and join after a screening. Our alumni work in hundreds of career fields, and have unique experiences and paths to success they are willing to share. 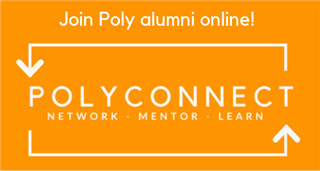 PolyConnect supports alumni to communicate, learn, and give back through meaningful individual connections. Access educational resources, a discussion forum, and more! Signing up is quick and easy! Click here to get started. Reunions are an important time for alumni to come together and celebrate their Poly experiences. Each alumni class celebrates their reunion every five years during Alumni Reunion Weekend held in the spring. With guidance from the Alumni Office, alumni event and fundraising volunteers help invite friends to the reunion, assist in the planning of the reunion party, or ask classmates to make a gift to the School in honor of your reunion. Please contact Katherine Vieser, director of alumni and community relations, to learn more and volunteer. Visit campus to have lunch with students and talk about your career. Learn more about the PolyConnect program and how to get involved. Pleasea contact Katherine Vieser, director of alumni and community relations, to learn more and volunteer. Have you recently moved? Changed your email? Accepted a new job? Gotten married? Then it’s time to update your alumni record! Click here to complete the online alumni information update form.